Just like the title states, Storming Bestial Legions LIVE ’96 captures these Australian extreme metal pioneers at the height of their powers, not long after their classic second album, Blood & Valour, was released. 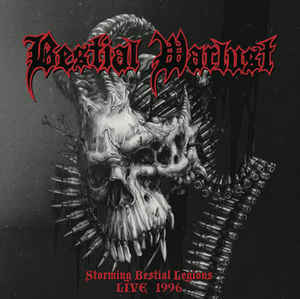 As such, the setlist BESTIAL WARLUST storm through here encompasses that album as well as their pivotal debut album, Vengeance War ’till Death, which went on to become one of the most mimicked black metal records in the new millennium, where the bestial metal subgenre they helped foment soon flourished. SKU: N/A. Categories: CD-Distribution, DISTRIBUTION, DISTRO STORE, VINYL-Distribution. Tags: Black Metal, Death Metal, Hells Headbangers ‎.